The overwhelming majority of the time, I’m writing about other people’s cooking here. And for good reason: it’s a lot better and more interesting than my own cooking. 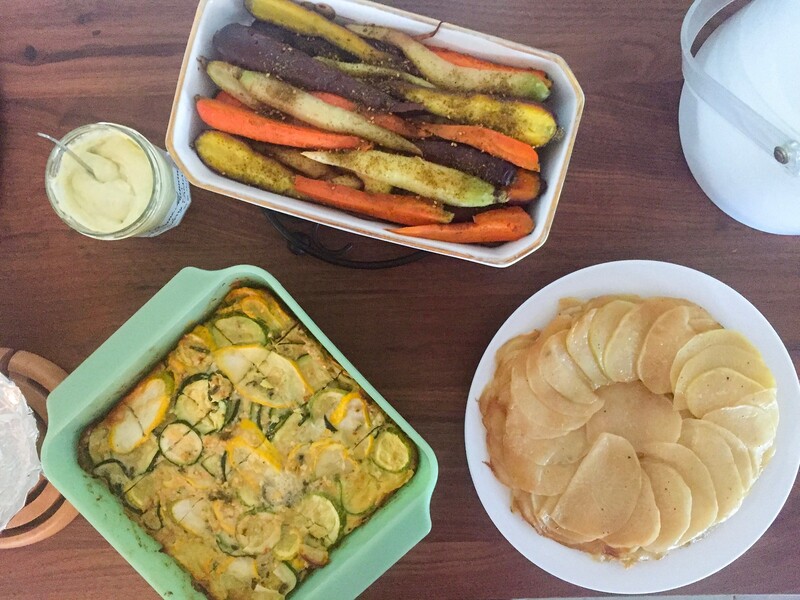 Not that we don’t use our home kitchen – contrary to how it might appear sometimes, we don’t dine out every single night, and we do try, with varying degrees of success, to have at least a few home cooked meals each week. Occasionally, the results might even warrant an Instagram post, especially if I’m using something from my Little River Coop CSA, or the backyard garden. Rarely are they worth writing home about. But after cooking a Seder dinner for family and friends earlier this week, I was proud enough of the results to spend a little time memorializing it. Passover is something of a culinary challenge: the whole prohibition on leavened grains can be pretty limiting, especially when it comes to dessert, and there are certain things that are expected: the matzo ball soup, the gefilte fish, the brisket, the tzimmes. I wanted to be respectful of tradition without being completely straitjacketed by it – let’s be honest, some of those old-timey dishes are better than others (for further reading: Charlotte Druckman, “Can You Update a Passover Menu and Still Satisfy Traditionalists?,” which was a source of much of the inspiration for my menu, though not any of the actual dishes). Also, I had a stockpile of CSA vegetables gathering in the refrigerator bin, and at least one vegetarian joining us for dinner. (You can see all my pictures in this Passover Home Cooking flickr set). 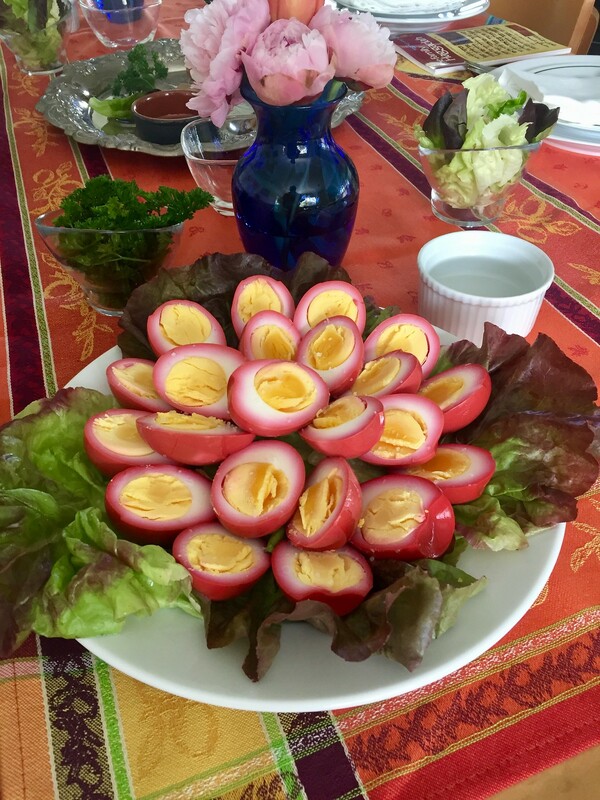 Beet Pickled Eggs - you’ll find a multitude of recipes for these online and elsewhere - my starting point was this Michael Solomonov recipe. I happened to already have a bunch of beet pickling liquid from some fairly ancient brined beets I made using the Bar Tartine recipe, so I used that as my base, diluting it with some water, reinforcing it with some white vinegar, and sweetening it with some sugar. I stuffed a dozen cooled, peeled hard-boiled eggs into a couple big jars and covered them with the beet liquid, then let them sit for two days in the fridge. I was expecting our crowd to be skeptical of these – actually, I thought I'd be eating leftover pink egg salad sandwiches for the next week – but they were a big hit. The colors – sunny yellow yolk bordered by a ribbon of white fading into magenta exterior – are really striking, and the flavor has just enough pickle-y kick to let you know it’s there without being overwhelming. These are super easy, beautiful, and a crowd-pleaser. Smoked Mackerel Dip - Unlike some people, I actually like gefilte fish, but sorry, I’m not going to make it from scratch. We happened to have some smoked mackerel fillets in a drawer of the fridge, so I figured - why not make a fish dip instead? I only stumbled across Felicity Cloake’s “How to Make the Perfect …” column in The Guardian by googling “smoked mackerel dip,” but appreciated the trial-and-error methodology of trying out multiple recipes and taking the best of each of them. It turned out quite nice, though I perked it up with supplemental additions of fresh horseradish, lemon and dill just before serving. Matzo Ball Soup - This was Mrs. F’s domain. I tried to pass along helpful tips via Serious Eats for getting your balls to be sinkers or floaters or somewhere in between, but she had no interest. I did well to just leave her alone. Her broth was golden and clear and deeply chicken-y; her matzo balls were just substantial enough to let you feel their presence, but light and fluffy rather than leaden. Chicken Marbella - Here I thought I was some kind of genius for suggesting we do Chicken Marbella for Passover dinner. Turns out that the Silver Palate Cookbook staple also has a long and well-established history on the Seder table. Brisket - My mom makes the best brisket. Just saying. One day I'll pass along her secrets. 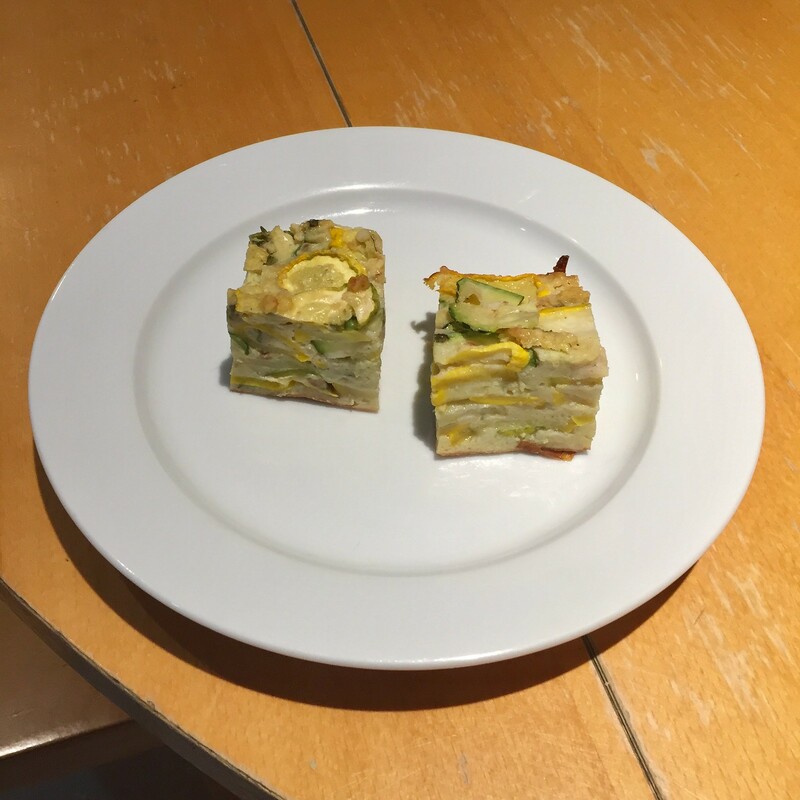 Summer Squash Kugel - I’d accumulated an assortment of zucchini and summer squashes from CSA the past couple weeks, which nobody else in my family will eat. So I figured, I may as well unload them on my guests. But how? I hatched my plan: a kugel. Thinly slice the squash crosswise (a mandolin might be too thin, you want them to have just a little substance), toss in a large bowl with 1 tbsp olive oil and salt, and then lay out in a single layer on a sheet pan and roast at 400° for about 5-10 minutes. I didn't want to brown them so much as just to soften them and get some of the liquid out. You might need to use multiple sheet pans or do them in batches; a Silpat comes in handy. Remove to a colander and let them drain any additional moisture. Crack the eggs into a large mixing bowl and stir until the white and yolk are blended. Add the cooked squash, sprinkle in ½ cup matzo meal, lemon zest, mint, and a good pinch of salt, and gently stir to blend (hands probably work best). Coat the bottom and sides of a baking dish with the remaining olive oil, then gently dump the contents of the mixing bowl into the baking dish. Try to arrange the squash slices so they are laying flat rather than pointing up (most seem to settle into the right position on their own, and in any event, precision is not essential). Bake at 350° for about 45-60 minutes, until browned on top and cooked through. Can be made in advance and reheated. Kohlrabi Anna - Kohlrabi is arguably an even bigger CSA challenge than a load of zucchini. I actually love the odd vegetable, which looks kind of like an alien turnip, and tastes a lot like broccoli stems, but it can be a tough sell. I had an idea: Kohlrabi Anna. 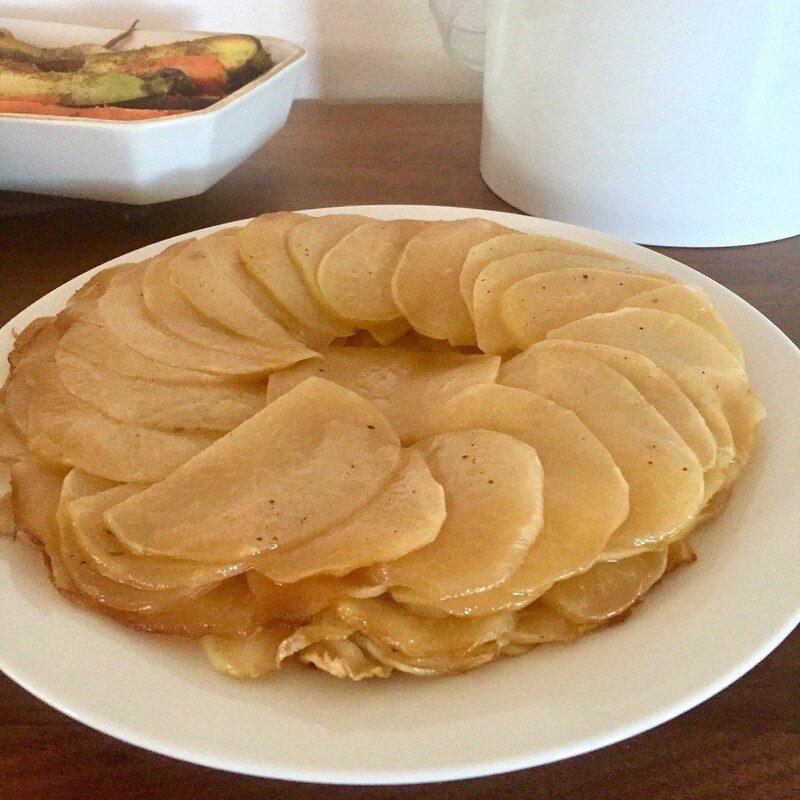 The classic Potatoes Anna involves thinly sliced potatoes layered with lots of butter and cooked in a pan until the outer surface is browned and crisp, and the potatoes are tender. I basically did the same thing, but with kohlrabi. I would have liked to have gotten a little more browning – I may have been too timid with the heat – but I really liked how this came out, the kohlrabi tender and nutty and sweet and suffused with butter. This also can be made ahead and reheated though it may lose whatever crunch it may have had. Peel and thinly slice the kohlrabi into rounds. Melt 1 tbsp of butter and toss the kohlrabi with the butter, salt and 1 tbsp of thyme. Rub bottom and sides of a 10" cast iron skillet with 1 tbsp butter. Arrange kohlrabi slices in circles around the bottom of the skillet, shingling them and overlapping the edges. Dot each layer with butter, sprinkle with salt, and continue layering kohlrabi slices until they're all used up. Put the skillet on a medium-high heat burner on the stove for 10-20 minutes to brown the bottom. Then move skillet to the oven and cook for another 30-40 minutes, until kohlrabi are tender. Remove from oven, and when feeling sufficiently bold, put a plate or cutting board over the top of the skillet, then flip the plate/cutting board and skillet – the kohlrabi should come out in one piece, like a cake. Garnish with more fresh thyme, cut into wedges, and serve. Roasted Carrots with Za’atar and Green Harissa Aioli - Charlotte Druckman is right: tsimis is totally broken. Tsimis, or tzimmes, or tsimmes, no matter how you spell it, is usually pretty gross – an insipid, cloyingly sweet stew of carrots and dried fruit, often supplemented with other sugary vegetables like yams. There's no contrast in flavor (just sort of generically sweet) or texture (just sort of generically soft). I don't think anyone actually likes tzimmes. I was not going to make a tzimmes. Instead, I took a few different varieties of CSA carrots, halved the fat ones, tossed with some olive oil and salt, and roasted them (400° for about 20-30 minutes, until the biggest ones were just barely fork tender), then sprinkled them with za'atar spice, and served them with a green harissa aioli. My inspiration came from the fact that dessert involved a meringue, and I had a whole bunch of egg yolks left over. I saved one of them for a favorite kitchen trick: immersion blender aioli. The recipe I've linked to is on Serious Eats, but the first time I saw this done, it was by José Andrés. Kenji uses the stick blender for half the oil (the canola portion), and then blends the olive oil in by hand. This seems unnecessary to me – I dumped it in all at once, and it came out just lovely. For some real excitement, make it right in a jam jar that's barely large enough for all the ingredients. If you start with the immersion blender at the bottom of the jar, and slowly, gently move your way up, it perfectly emulsifies all the oil without any splatters, and no need to decant into another container. Once the aioli is made, just stir in prepared green harissa – or any other flavoring you like – to taste. I used a couple tablespoons of this Mina Green Harissa, which I like quite a bit. I also cut back to just three garlic cloves in the aioli recipe, as I didn't want the garlic to be dominant. Not to set the bar too low, but this was better than tzimmes. 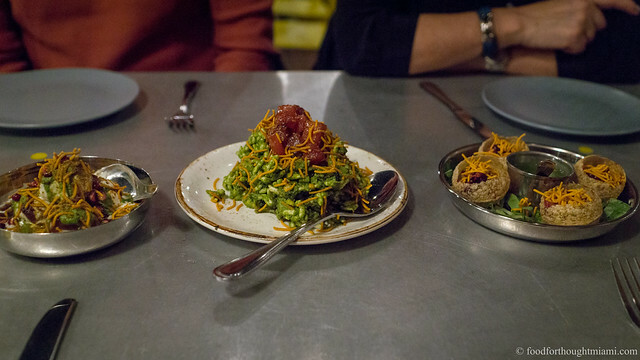 Bitter Greens with Horseradish Ranch - the traditional Seder plate includes bitter herbs – maror and chazeret – for which we now customarily use horseradish and romaine lettuce, respectively. I started thinking about how I could incorporate these flavors into a dish, and while staring at the latest bag of lettuces from my CSA, decided on a bitter greens salad with horseradish ranch dressing. Crunchy, peppery fresh radishes also seemed thematically appropriate. This is my go-to formula for a creamy salad dressing, which welcomes all manner of variations – different herbs, finely chopped chile peppers, a dash of hot sauce, some mashed avocado. No doubt it's a common formula, but I think I arrived at it by way of Andrew Carmellini's buttermilk dressing recipe in "American Flavor." Add vinegar to mixing bowl. Add horseradish and garlic and steep for 5-30 minutes. Add buttermilk, yogurt, mayo, dill and stir until combined. Add lemon juice and salt to taste. Add radishes and turnips to salad greens, and toss with dressing. 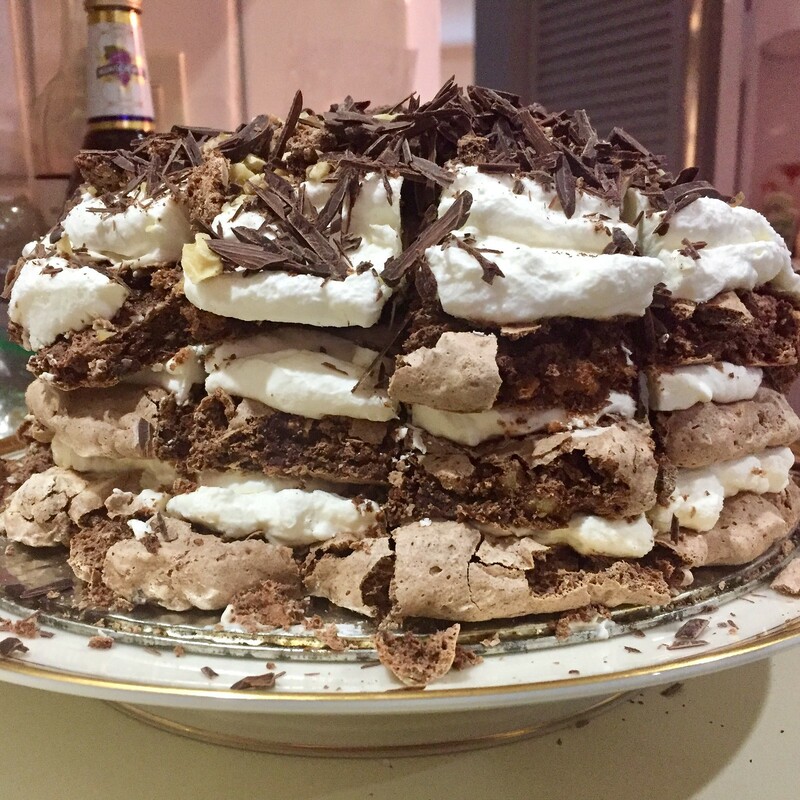 Walnut Chocolate Dacquoise - I am not a baker. Dessert is generally the least exciting part of a meal for me, and I'm even less enthusiastic about making them. But I've been watching lots of Great British Baking Show on Netflix lately, and it's boosted my confidence a bit. And besides, Passover desserts are already pretty terrible (no leavened flour), so how badly could I do? For whatever reason, meringue is a little easier for me to wrap my head around than most desserts, so I settled on this variation on a dacquoise. We had a big bag of walnuts in the house, and Mrs. F likes walnuts, so I substituted them for the hazelnuts. It was actually pretty easy: toast and chop the nuts, whip the egg whites to soft peaks, add sugar and whip to stiff peaks, mix in vanilla and almond extracts, then fold in the chopped nuts, chocolate chips, and melted chocolate. Then you spread the mixture out into three circles on parchment paper – as far as I'm concerned, they don't need to look perfect – and bake at 225° for 2 1/2 hours, then let them cool and dry out in the oven. When you're ready for assembly, whip three cups of heavy cream with 1/4 cup confectioner's sugar until you have whipped cream; then spread a layer of whipped cream over one of the meringues, top with a second meringue, repeat, top with the third meringue, and repeat once more. I then stuck it in the freezer overnight, sliced it straight out of the freezer (some bits will break off; save the crumbs), then moved it to the fridge the morning of Seder dinner. Before serving, I sprinkled the top with chocolate shavings, crumbled toasted walnuts, and the pulverized crumbles of meringue that had broken off during slicing. Folks: it was ridiculously good. The meringue was maybe a bit dense, but it had a good crunch and crumble, the flavor of the walnut and chocolate carried through, the whipped cream was an airy, fluffy contrast, and even if it kind of looks like it's falling apart around the edges, it sliced very nicely to show the alternating layers of meringue and cream. I may be stuck with Passover dessert duty now. Chocolate Toffee Matzo - this was a recipe I pulled from Bon Appetit, and accomplishes the unique feat of making matzo actually taste good (though of course it's not the matzo, its' everything you put on top of it). 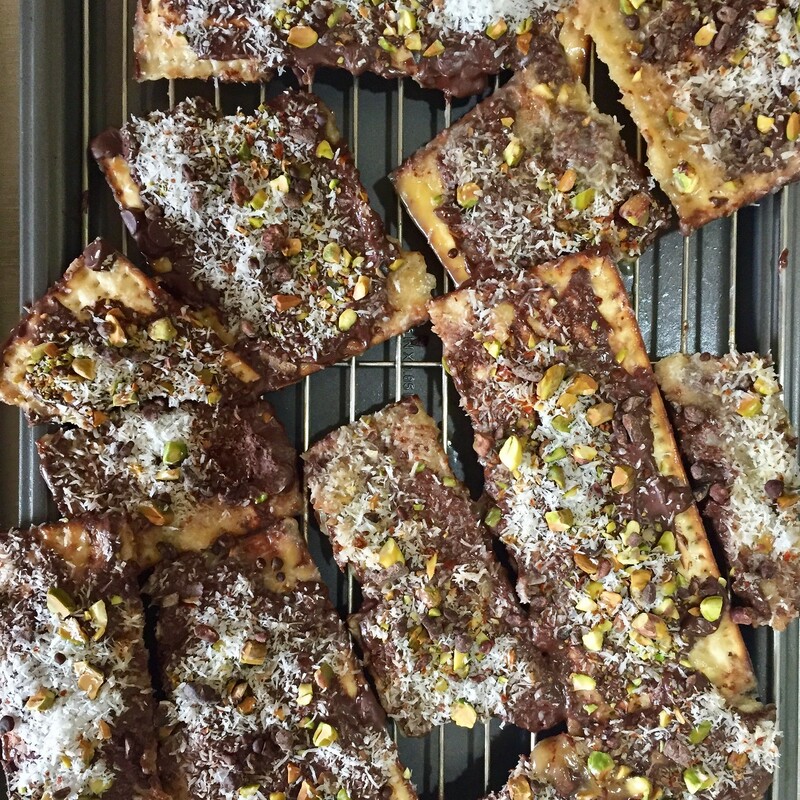 The idea is you make a toffee from butter and sugar (with a pinch of Aleppo pepper), spread that on the matzo, bake it for about 10 minutes, then melt chocolate over the top in the residual heat, spread the chocolate, and sprinkle with pistachios, coconut flakes, cocoa nibs, flaky salt, and more Aleppo pepper. Great flavors here; the toffee component left something to be desired – whether because the instructions are flawed (I don't think a "simmer" gets the toffee thick enough) or my own failed execution, the toffee wasn't spreadable, and wound up more like a soak in a hot, sweet melted butter bath for the matzo. Sticking it in the freezer after it was fully assembled and cooled helped it firm up. So we got to share the holiday with family and friends, we got to tell the story of Passover one more time, we drank wine and reclined, we used up a whole bunch of our CSA produce, and we discovered I can actually make a dessert. That was the fun part. Now comes the hard part – not eating bread for a week. Chag Sameach to all my fellow tribespeople, and as for the rest of you: please stop posting pictures of delectable baked goods for the next week. Oh my gosh - could these have been the same pickled beets I wrote about making two years ago? Maybe. While this menu is "kosher for Passover," it is not actually "kosher" – we’ve got both meat and milk all over the place at the same time. Hey, we each observe in our own ways. When you pull it from the oven, give the skillet a little shake to make sure the kohlrabi isn't sticking (if it is, I'm not sure how to help you). If you flip it onto a cutting board (I find this easier than a dish because the cutting board is flat), you can then slide it from the cutting board onto a serving dish. This is a big part of why Chicken Marbella makes so much sense as part of a Seder: you can offload all that sweet stuff into a meat dish where you at least get some contrast from the olives and capers and herbs. Pro tip: with the rest of the yolks, make a lemon or other citrus curd (I had blood oranges, and used this recipe as a starting point, but used five yolks instead of the three yolks and three whole eggs called for in the recipe, and cut the sugar back to 1/4 cup); then dollop spoonfuls of the curd on macaroons. The radishes can be sliced the day before and kept in ice water, they'll remain nice and crisp and this makes last-minute assembly easier. I actually made a piping bag from a Ziploc with a corner cut off, but my piping was, well, pretty inartful (let's just say I was reminded of walking the dogs) and so I then spread it out into circles using an offset spatula. Beautiful! Here's my own tip for ensuring that layered pan dishes like your kohlrabi don't stick: start with a round of parchment paper at the bottom, generously oiled on both sides.